On 13th January 2019, one of the entry door of regular (Non AC) local trains of central railway route saw a blue color electric bulb like device on top of entry door which emits a laser beam like light at the entry floor area of the platform. It was the very first test of this innovative idea on central railway route for public safety related to boarding of local train. 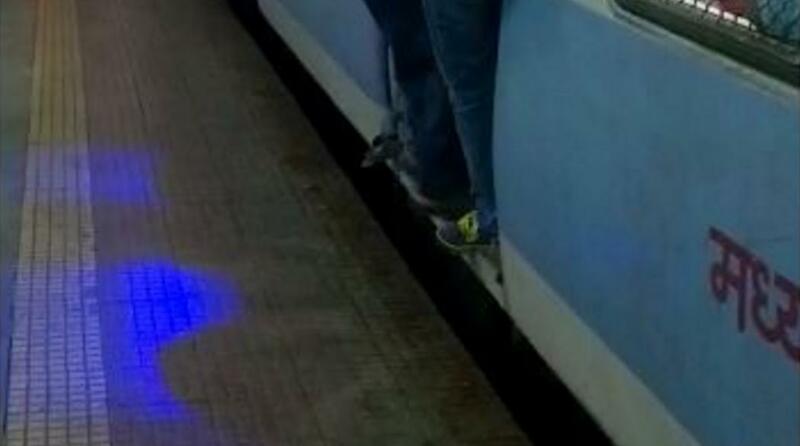 After the train halts, and just few seconds before it starts to move ahead on a railway station, this blue light gets ON and blinks for about 7 to 9 time (Approximate) emitting blue rays (patch of light) like laser beam on the floor of railway platform exactly at door’s entry area. In the bright day light too the blue colour was clearly visible on platform as well as the device, which is a thumbs up. The idea is to alert the commuter in hurry to board the local train that the train is about to start and restrain yourself from boarding as it can be dangerous. It makes very much sense in Mumbai as we all have seen people running and trying to get inside the local train till last moment. Major accidents in such scenario are fatal and few lucky survivors sometimes. On 22nd or 23rd may 2018, a lady wearing burqa was captured on CCTV escaping the fatal accident, saved by other people. It is that very moment where this safety lights helps. Watch the below video by ABP news. Till date none of the local train gave any indication on the exact moment it is going to start from a platform. I remember sometimes back they use to HORN, But that is no more happening, possibly due to noise pollution to the commuters standing near the engine. Not every station are equally crowded, With a minimal halting time (about 30 seconds approximate as per my knowledge) stations like Nalasopara (Western Railway) suffers a lot. Same happens at many other stations at Central route. Typical scenario at such stations are maximum crowd getting down at a time and hardly few seconds left for all those who wants to board. This triggers the event. Mumbai local train commuters are used to many challenges like crowd, train delays etc. Also to the fact that compared to last decade, commuting is much better now. We citizens and many tourist has observed and snapped some crazy moments of risking life in past like travelling on roof and getting electrocuted, travelling on window (life on half foot), and till date standing on doors footboard as the doors do not close. Installation of such Blue light indicators on entry doors will gradually bring in discipline and bring in more positive changes for local train commuting. It will be a great boon to handicapped, childrens, ladies and senior citizens as they can now understand that very moment of boarding danger. Once the safety lights are on every door of all the local trains in Mumbai, It will be a standard and will be followed by most. How About a Beeper on Doors of Coaches For Handicapped ? 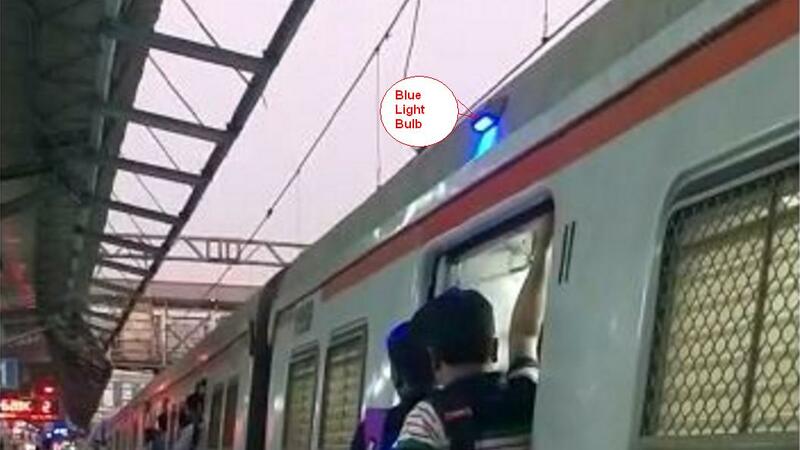 Thumbs up to the idea of blue light indicators as the test was successful and already the work of adding same on every door is in progress at Kurla. I just thought of those commuters who are blind (visually impaired) ?. The world is dark for them and those blue safety lights has no meaning for them. Alternate solution : How about following the same protocols and installing beepers on entry doors of every handicap coaches ?. I believe they need the most of such devices compared to others and it will bring such a relief to them. Like we have beepers on platforms that are installed exactly at locations where handicap compartment halts, We can have safety beepers on doors too. An Appeal to Local train commuters : Let’s accept and follow this positive move too. Since last decade we all have shown positive response to changing things in and around local trains. Some exceptions, Still major people, no more throw garbage, chips wrappers and keeps the premise clean. Thanks to ‘Swachh Bharat Abhiyan’. We no more see smoking in local trains and premise, No one travels on local train’s roof anymore. Their is less of nuisance visible (Thanks to mobile phones), No pushing and that more fights. That’s a wonderful sign of acceptance, progress and being a smart commuter. Not to miss, Ofcourse Railway officials has put in lots of efforts to make things happen at such a huge local train network, which is really commendable. Official Reference : Central Railway Twitter handle. Know These Local Trains and some pictures. For Lost + Found articles in trains Refer for Western and Central/Harbour. Since 2009, Japan railway platforms have this blue lights at every short distance which reflects and emits the blue colour light on platform. They believes that a person thought of commiting suicide, It reduces / changes their decision upon seeing those lights. Japan has faced large number of train suicides since long. Although, this has no relation with the fitting of safety blue lights on local trains, Just a thought as i remembered that video on YouTube.